Founding executives of Facebook once said the only way they’d be stopping in Waterloo Region, Ontario Canada, was if the plane crashed while flying to the east coast. How times have changed. If there is any better evidence that things are hopping in Waterloo Region, it’s got to be that the tech and talent in this little area west of Toronto can attract someone like Chris Hughes, one of the three co-founders of Facebook, to speak as a part of “Entrepreneur Week” on November 16th. Hughes is a young entrepreneur who co-founded Facebook with Harvard roommates Mark Zuckerberg and Dustin Moskovitz, and served as spokesperson for the company. 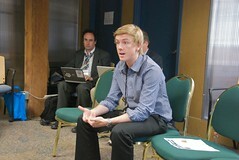 Hughes also worked as coordinator of online organizing for Barack Obama’s online social networking website. Fast Company featured Hughes on their April 2009 cover with the headline: “The Kid Who Made Obama President; How Facebook Cofounder Chris Hughes Unleashed Barack’s Base – and Changed Politics and Marketing Forever”. Hughes will speak about how he took a little idea, defeated massive market competitors and made a lot of money doing what he loved best – marketing to the masses. If you want to check it out, Entrepreneur Week is jam-packed with lots of tech entrepreneurs, VCs, investors, and great startup ideas. They claim it’s the best place in the world to do a startup. It all happens November 16-22, 2009. Check out www.entrepreneurweek.ca to learn more or to register. Other agenda highlights of the week include: Tim Bray, father of XML and internet search, the Waterloo Entrepreneur Hall of Fame Gala, Founders and Funders Dinner, Strategic Partnering Day, as well as a number of experiential sessions run by our homegrown entrepreneurs. Find out why Hughes is finally stopping in Waterloo, sans plane crash. Check out full agenda details of Entrepreneur Week. Follow us on Twitter @Communitech and use hashtag #ewk.